« Could The Recession Be Over? The retail investors sentiment as measured by the AAII survey was equally balanced with bears and bulls both at 39% - and the rest undecided. To arrive at the tie, the bullish camp shrank by 9% points and the bears increased minimally (2% points). ChartCraft’s Investors Intelligence continued to grow more bullish this week with 47.7% bulls and 23.3% bears (with the rest neutral). That’s more than twice as many bulls as bears! The last time we had this much optimism from this measure of newsletter editors’ sentiment was in December 2007. Interestingly enough, the S&P 500 back then was trying to get above its 200 day moving average - it didn’t succeed for too many days. The Hulbert Stock Newsletter Sentiment Index (HSNSI) confirms the II data showing that the average equity exposure has increased by 60% points since early March 2009. Although some shift in sentiment is normal at the end of a bear market, this is double the average increase in the first 3 months of previous bull markets. The CBOE put call ratio (equity only) fell to 0.55 on Thursday. That is a level which, while not being an extreme low, is low enough to show considerable confidence in the stock market. In effect, there were almost twice as many calls traded as puts (twice as many bets that the market would go up, as opposed to down). Other than this small blip, the larger picture hasn’t changed much since the last chart I featured in the sentiment overview last month. The ISEE Sentiment data was even more lukewarm, offering no real clues from a contrarian perspective. 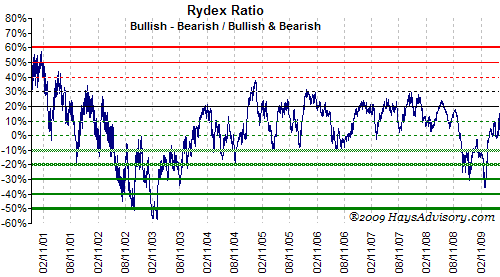 The ISE equity only call put ratio was 191 which is relatively high. But we’ve seen a few isolated instances at this level before and it hasn’t been enough to stop prices from rising. The latest data from Hedge Fund Research shows the average hedge fund 45% net long (as of May 19th 2009). That’s up from 33% earlier in the year but not as long as one year ago. The good news for the bulls is that there is still a lot of dry powder in hedge-land waiting to be deployed (especially if the market keeps going up and forces hedge fund traders to get off the fence). The bad news is that the so called ’smart money’ hasn’t really believed in this rally… yet. Interesting that you call hedge funds “smart money” and allude to stock letter writers as “dumb money”. Well looks like the smart money missed a 40% rally. I put smart money in quotes for a reason. On average the smartest and most well capitalized players are the hedgies. ‘Dumb money’ would be retail investors/traders. The sort of players that play the market part time, punters if you will. as measured by ChartCraft (Investors Intelligence) at the spring rally newsletter editors were very bearish - 47.2% were bearish. And according to Hulbert’s Stock Newsletter Sentiment Index a bit earlier in March 6th the average market timing newsletter was recommending a 20% short position to their clients. This is why we use these measures as contrarian indicators and personally I listen to smart guys like Kass (who is a hedgie). Finally, the BP index has reached an extremely high level where historically it has flagged important market tops.